I’ve had instruction from Mike and also my current irons were custom fitted through Mike at Lytham Golf Academy. He made everything very easy both in my lesson & the whole custom fit process. I have, and will continue to, recommend both Mike & Lytham Golf Academy to any fellow golfers as the knowledge & expertise is first class. 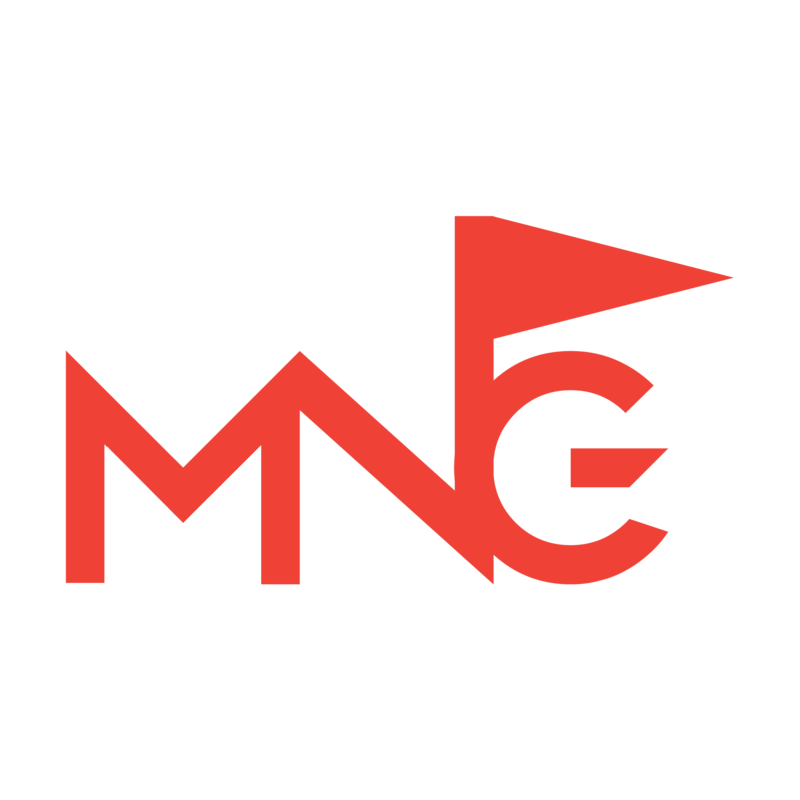 Went to see Mike for a club fitting and the service and advice were tremendous. Also gives my son lessons and has brought him on leaps and bounds over the years. Would highly recommend! Email received from a pupil following a board competition win……. Hi Mike. It was good to see you today for a lesson at your new setup at Lytham Golf Academy. Great session and plenty for us to both work on, Duncan’s swing is especially impressive! I’m sure we will be back in a couple of months for a health check. Exceptional knowledge & service as always. Thanks. Hi Mike, Having been coached by you at Barrow Golf Club I can say with confidence that you are up there with the best! After 10 years off from playing golf after two hip replacements your coaching made all the difference. Three months after making my comeback in 2014 I shot 77 less 16 net 61 to win the Ross Trophy at Barrow. Your coaching was instrumental in making that possible. Thank you and good luck at Lytham. I’m trying to cultivate a swing that will allow me to get round a golf course in a decent score. There are times when I’m sitting at home that I think of something I want to try. The beauty is that one quick call or I can book online and I can be hitting balls in a warm friendly environment and following the flight, spin, speed etc. of my good or bad shots. I would recommend half an hour or an hours practice to anyone either struggling with their game or who simply wants to see how good their strike and ball flight is. It’s a good place to try different golf balls too. Thanks for the lesson Mike, you spotted my problem straight away! Have been for a practice today and feel much happier..chipping more confidently, can hit short irons better already, just need a card in my hand now. Cheers for today Mike. Really feel like I’m making progress. The way you explain things makes it sound so simple! Thanks! I have been working on correcting a horrible over swing, delivering from the inside and setting too late for the last 3 years! Believe me I have spent ££££’s on different advice from credible coaches, some very worthwhile – some not!! One extended lesson today with Mike taught me how easy it was to actually understand what was happening compared to what I was feeling in my swing and how easy it was to change my path & angle of attack! Lots to work on in MY new delivery, however I now understand why it breaks down. A long 380 mile round trip but worth every minute! Many thanks to Mike at Barrow Golf Club. Excellent and clear instruction. Makes it simple and easy to understand. Very helpful and a couple of tips to help me work on my game too. Will be booking some lessons in the near future as well. Thanks Mike. Mike. I knocked a few shots off after that lesson the other day! My best round ever! Thanks again for your help on Saturday Mike, just played a round at Windermere GC and hitting it a lot better. Many thanks. Mike I would like to thank you for the lesson last week. Thought I had a decent swing until I watched it on the screen,( like Rory). How wrong I was. Putting your good advice into practice is hard, but very rewarding. Thanks Mike. Great golf lesson today with Mike, such a good teacher of the game. First class equipment and excellent facilities. Only been there 30 minutes and already got some good pointers to work on. Looking forward to my next lesson! Top coach! Once again an excellent lesson great understanding of problems together with well explained and demonstration of solutions. Actually seeing the results of the recommendations on the feedback video gives you the confidence that you are hopefully moving in the right direction. I would recommend a lesson to anyone. Luke really enjoyed his one to one lesson tonight, he has come home full of things he’s been taught and is really looking forward to going again on Friday. Thank you. 1st class facility with awesome technology, highly recommend to anyone! Hi Mike, the lessons have been brilliant, I will be back for more in the future and I will be recommending you to anyone that are after golf lessons!Â Very professional service and advice! Keep up the good work. Hi Mike, I just wanted to say thanks for the lesson the other as it has helped me win the Ross Trophy today & the Schofield Golf Day yesterday! The best Â£20 I’ve spent, cheers mate. “Hi Mike,Â Just wanted to say thanks for the lessons my game is all coming together now, I had a 79 gross yesterday and won the Evening Mail competition and that included 4 x 3 putts too! I only missed 2 greens on the back 9 so my handicap has now been cut to 12! Cheers. “Mike, I just thought I would send a note to thank you for the work you have done with me over the last few months. I really enjoyed my lessons and more to the point understood and found myself improving and developing with your guidance enhanced with your excellent teaching room / facilities. I think the combination of video and your new GC2 Simulator is excellent as you can see what to work on in the swing and see the results of every change transferred on the screen to actual ball flight / spins / trajectory / distances ect. As a result i now know what to keep working on for my desire to improve & no doubt will be back to recap. I was also impressed with the GC2 Simulator for its other uses. I am now in the possession of a new driver and 3 x Fli Hi irons which I know have the correct shafts for my swing. In addition I have all the carry distances for all my clubs and with you altering all my loft, lie and gapping of my set it has left me knowing it is now down to me as I can’t blame anything but myself if things are not going well. “After my first video lesson with Mike I went away feeling really positive. Not only can you physically see the areas that need improvement, you also learn about the good points.Â Mike has a real knack of getting his instruction across and provides drills to help swing changes.Â I really enjoy the way Mike breaks down the swing to work on each part individually.Â Mike’s patience and good humour really help to make the lesson enjoyable”. I have benefited immensely from my series of lessons with Mike. I like his approach to the individual person he is teaching. In my case initially Mike worked on establishing a firm base to stop me from dipping into my shots.Â When one issue was sorted we worked methodically to my next problem getting the swing plane correct. 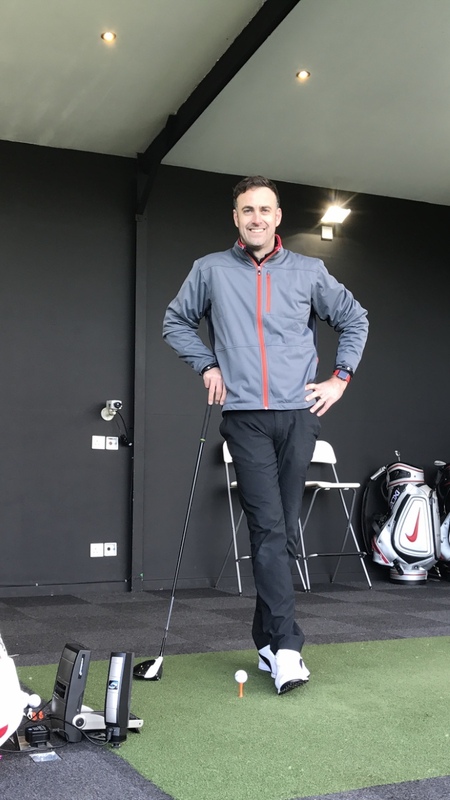 This has enabled me to strike the ball with much more accuracy and also given me confidence.Â I have had a number of lessons from basic setup to Driving, chipping, bunker shots, short game and putting. All of which have been a benefit to my game.Â The best thing I have brought away form all my lessons is that Mike does not bombard you with changes, preferring to correct one problem at a time, which I have been able to put into practice on the course.Â I can honestly say that before I had the lessons with Mike I was drifting upwards from a 6 handicap rapidly. I am now still off 6.2 but am playing more consistently than ever, even though I feel I have improved greatly I still have lessons every season because it is easy to drift back into your old faults, Mike quickly gets you back on track. I wish I had the lessons ten years ago! “In March I arranged to visit Mike at Barrow Golf Club for a fitting with a view to possibly buying some new clubs. To my surprise Mike video-ed me trying various makes and gave me some feedback on my swing. 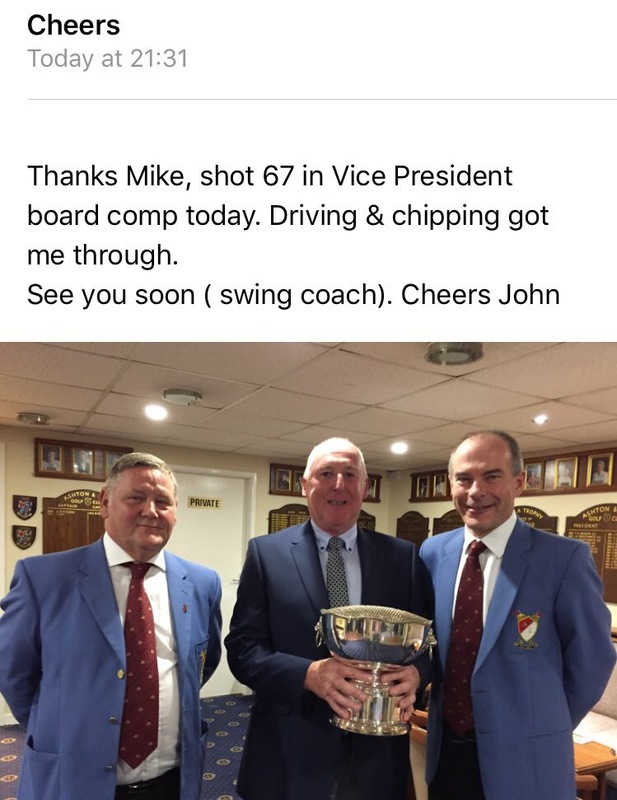 The upshot of that meeting was that I booked a group of six lessons and I was pleased that Mike suggested it would be better to sort the swing out than purchase so there was no sales pressure. The first lesson I found extremely helpful. Mike explained from the video footage what I was doing and with the technology of drawing on the screen and freeze framing the video it was so very clear what I needed to do to change and improve my swing path. The video analysis gives you instant feedback and it really helps in showing what you perhaps are doing wrong and then what you need to do ,after discussion, to put it right. Mike was great, very personable, amusing and friendly. He made me feel at ease and was extremely positive and encouraging. He also gave me practice tips to try before the next session. Following subsequent lessons I went to his web site where I could download a resume of the important points from the lesson spoken by Mike and some video footage to show how I was progressing. There is also a space to add your own comments which I did. In the time since March my handicap has come down by four shots, I am definitely hitting the ball better and its really thanks to Mike and his advice . When I finally decided to buy a new driver and fairway wood Mike was the person I went to. I thoroughly enjoyed my series of lessons. Mike is a great teacher and ,provided you put some work in yourself on the practice green, you are certain to improve. I did and am very glad I found him”. “Mike started with the basics and taught me how to develop my swing. He quickly identified what I needed to work on and did not waste time on things he thought I did well. Taking lessons from Mike has enabled me to improve my game, raise my confidence and lower my handicap”.